Often as not our members are asked questions about MWV Habitat Affiliate, such as: “how did you guys do on the yard sale”, “who do we call to donate furniture”, “how’s the house coming in Madison”, “do you sell furniture on-line”, “how do I volunteer”, among others. So, an update is in order. The latest event occurred Labor Day weekend with the last indoor yard sale of the season. Thanks to John Lowell and his staff at Attitash Mountain Resort, Habitat was provided use of Bear Peak Lodge to store and sell furniture, appliances, building materials and home furnishings for its three indoor yard sales spanning spring through late summer. Sam Johnson heads up furniture pick up and the yard sales for Habitat, assisted by a dozen or so volunteers, many of whom also participate in house construction. Thanks also go to Matt Braun, owner of Matty B’s who provided lunches for the volunteers. The importance of these yard sales cannot be overstated, as the revenue derived from the sales equates roughly to a third of the cost of building a house. Furniture is collected throughout the year on Saturdays, winter excepted as well as on the weekends of the yard sales. How does it all happen? All one has to do is call the Habitat office, 356-3832, or visit the Habitat web site (mwv-habitat.org), click on “Donate” and follow the prompts. A donor will receive instructions as well as an on-line form that will facilitate the process. The web page lists items that will not be accepted and the necessity for the items to be in good condition and salable. 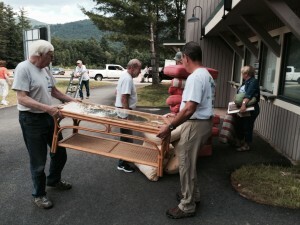 Currently, there is a problem – a lack of drivers/volunteers to handle furniture. 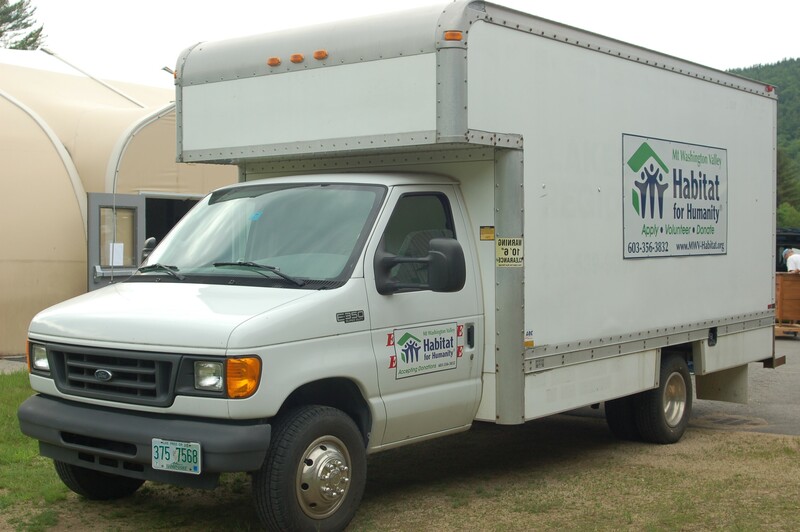 Habitat is putting out a call for volunteers to drive its box truck and load/unload furniture. A few hours on Saturday, picking up donated furniture and loading the items into a storage trailer. If you or someone you know might be interested in helping with this vital fundraiser, call the Habitat office, 356-3832. You need to be over 18, obviously have a driver’s license as well as a clean driving record. MWV Habitat also offers an “On-Line Yard Sale” whereby the donor and buyer are connected on-line, effect a transaction, arrange for transportation of the item(s) and Habitat receives the sale proceeds. As Nels Gustafson, Habitat board member who manages the on-line program states, “it is a simple process”. The Donor provides Habitat with item description, photo and contact information. Habitat posts the item description/photo with asking price on its web site. The Buyer completes an on-line form with appropriate contact information and bid price. Habitat awards bid and instructs the buyer how to make payment. Once received, Habitat effects contact between the Donor and Buyer who in turn arrange for pickup of the item. The Donor controls all contact data ensuring confidentiality and Habitat provides a tax deduction form. Greater detail and form(s) can be found on Habitat’s web site, mwv-habitat.org. As mentioned, funds derived are critical to the house construction process. 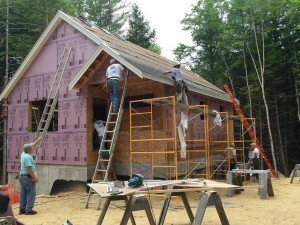 Noted by Anthony Ruddy, MWV Habitat Construction chairman, “current construction on Grison Road in Madison is on schedule thanks to the many volunteers who are there each Thursday”. Additionally, labor and equipment provided by local contractors such as Burnham Co. (site clearance, excavation); H.R. 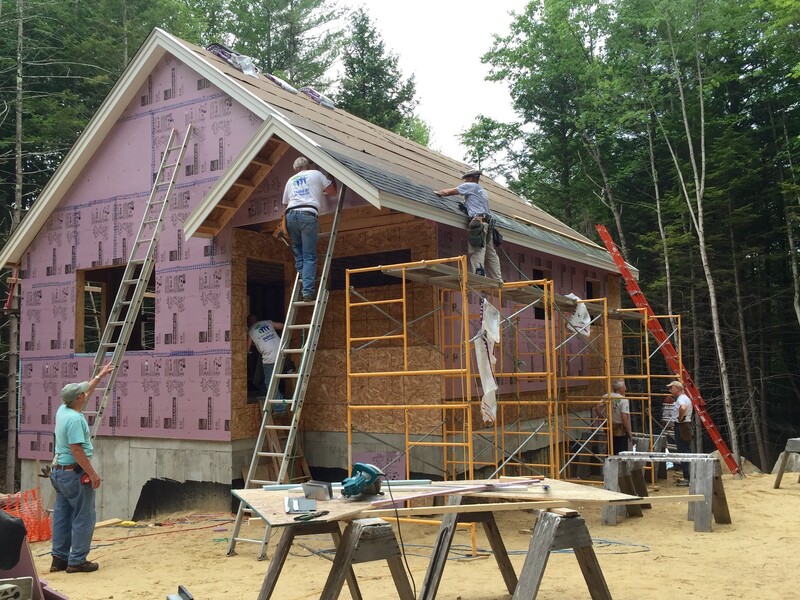 Hoyt (foundation, trusses); Chris Martin & Paul Jean (roof construction); Mike Lyons (roofing); NH Aluminum (siding) and construction materials provided by Chick Lumber and Silver Lake Hardware have contributed immeasurably to the mantra ”neighbors helping neighbors”. Integral to the home-owner process are the sweat equity hours put in by the family selected to be the new home owners. The Arruda family’s commitment to the 300 hours is seen at the site each Thursday as John works side-by-side with the construction volunteers and his wife Kelly coordinates and delivers lunches from various restaurants and organizations in the Valley. Since its founding in 1994 by Al Risch, Bob Morrell and Ted Pettengill, the MWV Habitat Affiliate has refurbished four and built 16 homes to qualified families. Dan Osetek, Board president of the MWV Affiliated noted: “ this equates to 48 children who have been provided safe, stable and affordable living conditions”. To learn how to volunteer your time and services, make a contribution, receive a newsletter, or apply for a house, visit MWV-Habitat.org. As a new home owner recently told a board member, “ you have no idea the difference this home has made in my family’s life”!